Vintage cars and motorcycles, which share a similar heritage and are often loved equally by the same people, now have another bond - the Pebble Beach Concours d'Elegance. It took a while, fifty-nine years to be exact, but there on the grass of the18th fairway, nestled off to the side between two giant sand traps, were fifteen of the loveliest motorcycles you could imagine. Next to their immediate neighbors, a collection of classic open Packard touring cars, they appeared tiny - the motor of one of them would fit in a Packard's headlamp - but they also looked like they belonged, like long-lost relatives who have finally come home. 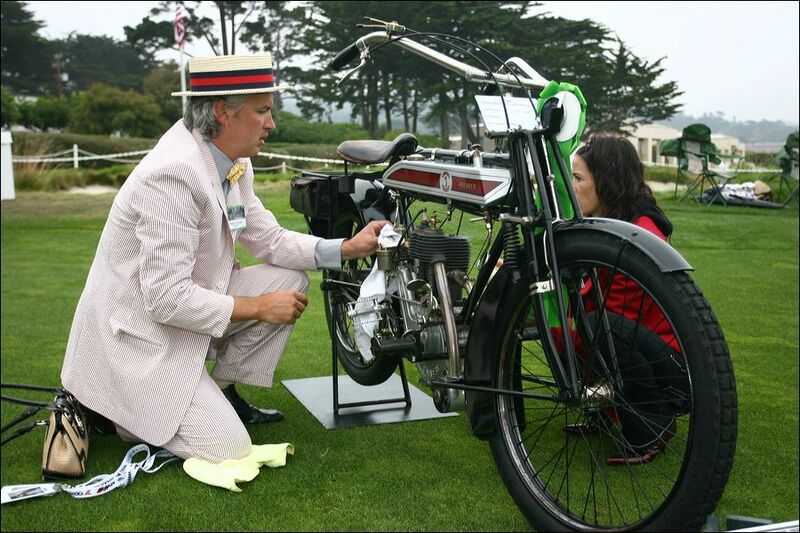 Peter Young of San Francisco putting the polish on his 1913 Premier. This was Class X, "British Motorcycles Through 1959." That cuts a broad swath and the bikes the Concours selected for display were correspondingly eclectic. In years they ranged from 1913 to 1957 and included touring and racing machines. Two side-car rigs were positioned at each end of the motorcycle area and closest to the cars, as if to help a Concours visitor make the transition from four wheels to two. Close by was Herb Harris's iconic Vincent Black Shadow, rode by Rollie Free to a record 150 mph at Bonneville, with the famous bathing-suit photo placed at the front wheel. "Gunga-Din," a recently restored Vincent with a rich racing history, was positioned next to a rare AJS, called the "Porcupine" because of its spikey cooling fin design and owned by the Barber Museum. Farther back, a 1926 Brough-Superior (the same one we saw in the Art of the Motorcycle) and a Scott "Flying Squirrel" rewarded the car buff who ventured deeper into the motorcycle display. Motorcycles and cars also share a connection to Ed Gilbertson, the Chief Judge for the Concours d'Elegance both at Pebble Beach and the Legend of the Motorcycle, which explains the similarities in judging procedures and judicial attire (panama hats and blue blazers) at the two events. The judges for the motorcycle class, Don Danmeier, Mark Lambert and chief Jim Thomas were to focus on originality and authenticity. "It wasn't easy," said Thomas, "there were so many bikes right up at the top. We had to get really picky. And we've been trying to get bikes here for years. Now they're realizing that bikes have a real part to play in this whole history." The moment of truth in the judges' inspection was the request to start the engine. The Black Shadow was having a problem here, as it would fire but then quit when the starter wheel was removed. The tension was maximum at the point where it finally kept running, to applause from the onlookers and the amazement of the rest of the fairway, which heard for the first time a straight-pipes Vincent in thundering glory. The judges finished their inspections around 10:30 am just before the fairway was opened to the public. The price of a ticket, $150 in advance and $175 at the gate, was a selection process in itself but did not prevent a sell-out crowd and a packed fairway. By mid afternoon, just walking around required care and sensitivity, a virtue that all visitors seemed to possess. The presentation of awards commenced at 1:30 pm. To add drama to a process that would go on for three hours (it takes a while when there are 32 classes), the three winners in a class would proceed together toward the stage, without knowing who had placed first, second or third. Third place was summoned first. The announcement of second place then produced a victory wave from the driver of the remaining car, the Best of Class. Class X was called near the very end. First up was the 1932 BSA W32-6 BSA with side car. Driver Charles Sougias and owner-passenger Theresa Worsch wore period riding gear and looked relieved and happy as their rig putted up the trophy ramp. Paul Flugfelder's Vincent, "Gunga-Din" took second place, leaving first place honors to George Barber's superb 1954 AJS E-95. At the winners' circle, champagne magnum in hand and surrounded by his crew, George Barber, with sadness in his voice said, "I'd like to dedicate this win to Henry Surtees, who lost his life several weeks ago in a Formula II accident. He was John Surtees' son and such a wonderful young man and it broke all of our hearts to lose him." But on a cheerier note, he concluded, "We're very very pleased to be here and delighted to have the first win at the first motorcycle event at Pebble Beach - what more is there in the motorcycle world?" The car (or motorcycle, for that matter) in the winners' circle that gets the most votes cast by each of the class chief judges is named Best of Show. Undoubtedly one of the highest honors in the world that a classic car can attain, it was awarded this year to a 1937 Horch Sport Cabriolet owned by Robert M. Lee. The Best of Class, George Barber's 1954 AJS E-95, here in the winners' circle. While the Concours on Sunday is the main event of a week-long series of attractions during Car week, there was plenty to see off the fairway. Classic Car Week in Monterey and Pebble Beach are prime venues for the introduction of new upscale models and concept cars from major manufacturers and boutique companies. But for the motorcycle enthusiast, the place to be was the MidAmerica Auctions tent where bikes of all marques and eras were on display. About 80 motorcycles were available in an e-bay style on-line auction. Top dollar was paid for a 1912 Flying Merkel ($90,000) while a 1924 Nimbus drew the second largest amount, at $80,000. MidAuction owner Ron Christensen noted that there were bargains as well as wallet-busters on the floor. He thought that a 1971 Benelli 250cc Club Racer that went for $5500 and a 1958 Triumph Blackbird restored by Jim Hiddleston ($12,500) were particularly good buys. An unrestored (and therefore quite rare) Brough. The highlight of the auction tent was an exhibition of seven Brough-Superiors on the occasion of the US-debut of the born-again Brough-Superior company. Most of these beautiful machines came from the collection of Bryan Bossier. The two re-created Broughs that were hand-crafted by the company were for sale. Gorgeous motorcycles in all respects, they attracted the attention of connoisseur Jay Leno, who popped in for a visit and immediately dove into a nuts-and-bolts discussion with Brough CEO Mark Upham and Bossier at each one of the machines in the exhibition. After it was all over, it was time for the annual exodus from the Concours, in which Jaguars, Lamborghinis, Maseratis and Packards share the road with pedestrians, all wanting to get home. The best sight of the day was entrant Peter Young, resplendent in straw hat, ice-cream vendor jacket and red bow tie, riding his popping, smoking 1913 Premier through the traffic - with a passenger on pillion. Now that's class.